HD Version Dizzy Prince of the Yolkfolk Coming Soon to Android, iPhone & iPad. Dizzy Prince of the Yolkfolk is an adventure video game published in December 1991 by Codemasters for the Amstrad CPC, Atari ST, Commodore 64, ZX Spectrum, DOS, NES and Amiga. It was the sixth game in the Dizzy adventure series. Initially it was only released as part of the Dizzy's Excellent Adventures compilation. The creators of the series, the Oliver Twins outsourced the video game company Big Red Software to design and develop this game. This was probably the smallest Dizzy adventure game in terms of the number of rooms, but this meant that it was maybe the game with most critical acclaim. Magazine Amstrad Action was noted in its dislike of walking from one area of the map to another to complete problems which it said was tedious. The smaller map helped to counteract this. Reputed to have been commissioned, designed, developed and completed in less than a month. 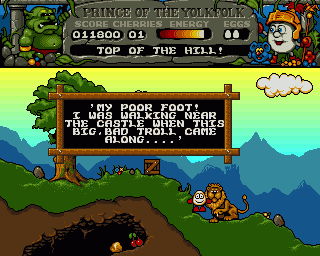 The game in November 1992 was enhanced and re-released with the illfated Aladdin Deck Enhancer under the title, Dizzy The Adventurer. The title was then released in 1993 as part of The Excellent Dizzy Collection. The game interface and mechanics resemble those of Magicland Dizzy, discarding changes introduced in the fifth game. In November 2011, it was announced that the game was being released on the Android and iOS platforms with an HD remake of the game. Grand Dizzy was feeling very down one day, so Dizzy and Daisy decided to cheer him up by baking him his favourite food, cherry pie! So off went Daisy to get some cherries from her cupboard and there were none to be seen! "Pogie's pinched the cherries!" she cried, as she saw Pogie's pawprint in the cupboard. "That darned fluffle. Come here you!" and Pogie promptly darted off into the enchanted forest to escape Daisy's rage. Dizzy and Daisy decided to go into the forest to catch Pogie and gather some more cherries at the same time. Whilst searching for Pogie they got lost and found a castle, where they thought they would find help, but it seemed deserted. They looked in the castle for Pogie, but Daisy caught herself on a mystic spinning wheel. She started feeling really sleepy, so she found a bed and went to sleep. "Wake up Daisy, wake up!" shouted Dizzy. But before he could wake her up, Rockwart the troll caught him and locked him up in an underground prison! Now Dizzy must escape, wake up Daisy from her enchanted sleep, defeat Rockwart, and find the cherries along the way. Gamers in Europe are well acquainted with the classic adventure title Dizzy: Prince of the Yolkfolk, the sixth game in the Dizzy adventure series developed by Codemasters. Fans of the series now have an egg-cellent reason to rejoice, as the publisher has announced that an HD version of the game will hit store shelves on December 9 on iOS and Android platforms. The new version of the game retains the structure and level design of the original, but with remastered graphics, and a reworked interface and touchscreen controls. Other details about the port have yet to be announced. Dizzy: Prince of the Yolkfolk was a 2D adventure title that saw players control the anthropomorphic egg Dizzy to collect items and solve puzzles in order to rescue his beloved Daisy from her oppressors. The game was originally released in 1991 on the Amstrad CPC, Atari ST, Commodore 64, ZX Spectrum, DOS, NES, and Amiga. *HD version of 1991 2D adventure title coming soon to Android, iPhone, and iPad.